Product information "Irish Linen Shoestring Pocket Square - White / Navy"
White linen with navy border: a very versatile pochette. Looks best on grey suits, so the blue doesn’t get drowned (or on significantly lighter blue). For example: light grey suit, white shirt, midnight grenadine tie, navy braces, black oxfords. Or, a little more sporty: brown jacket, white/blue checkered shirt, navy knit tie, striped braces, light grey pants, mid-brown fullbrogues. 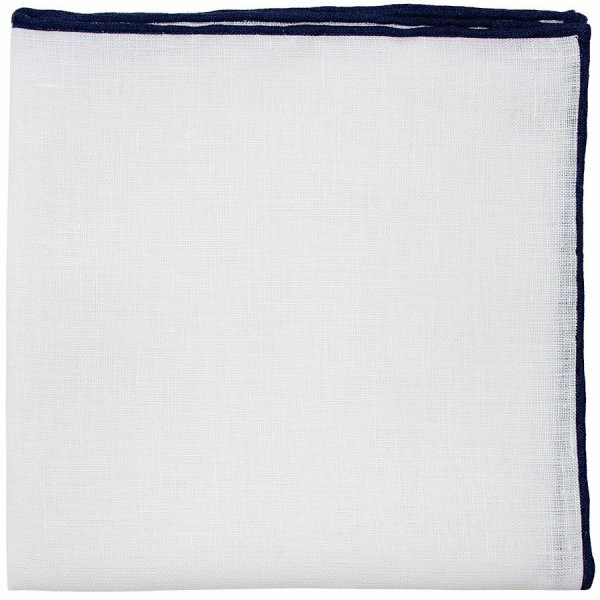 Related links to "Irish Linen Shoestring Pocket Square - White / Navy"